Pygmy Owls are altitudinal migrants: high country in the warm months; valley bottoms in the cold months. Although seen, the Pygmy Owl has not been as common this winter as some other years. It may be that this year’s sparsity of irruptive birds, upon which this owl feeds, has prompted it to not bother with visiting the valleys. 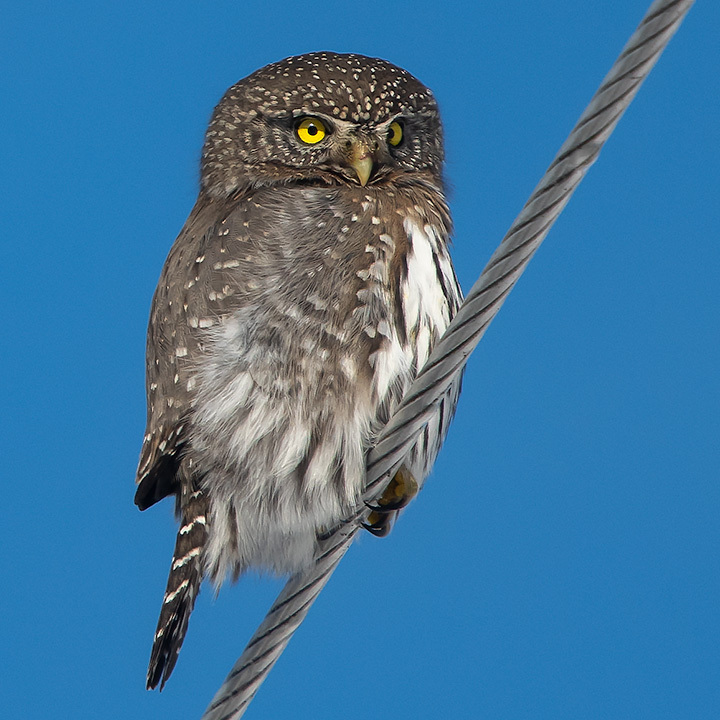 A Pygmy Owl hunts from a power line. What a fantastic photo of this little owl! Amazing picture, incredible eyes. Thanks. Some time ago a pygmy owl perched silent and still in my cherry tree until a mouse poked his head out from under my deck. It took a split second for the owl to re-appear in another tree facing away from me with a mouse tail between his legs.